In honor of upcoming Father’s Day, we decided to focus our In the Vineyard on a man with deep Dry Creek Valley roots, Richard Rued. On a perfectly sunny and breezy morning in June, we sat down with both him and his wife, Dee, at Rued Winery for an update on their vineyards and a deeper dive into his family’s history. Richard’s great-grandfather, Henry, first came to Northern California in the late 1800s from Switzerland, and planted grapes in Russian River Valley. Henry moved his entire family here in 1890 to a property in Alexander Valley. Both of these locations had vineyards, but were uprooted during Prohibition to plant mostly apples and prunes. The Alexander Valley property was also a small working dairy ranch and the perfect place to raise the Rued family. It wasn’t until 1957 that the Rueds bought their first Dry Creek Valley property. Richard had taken this new property as a venture for FFA (Future Farmers of America) in High School by growing the family’s first Dry Creek Valley grapes. Richard remembers getting off the bus from school and going straight to work on their ranch. It was his responsibility to bring in the sheep – a task that his father, Paul, would help him with in a slightly unconventional way. You see, on their property was a small airport. Paul would take Richard up in a plane to search for wherever the sheep were that day so that Richard could ride his horse directly to the flock and not have to spend hours searching. Richard still remembers the steep ascent fondly as time well spent with his dad. Both Richard and his wife, Dee, still live in Dry Creek Valley. They have two sons – Steve & Tom, who were both raised in the Valley and now work in the wine business. Tom works in the vineyards with Richard and Steve is the winemaker for the Rueds’ family label – Rued Winery. The label is relatively new with their first vintage in 2000 with their winery and tasting room opening just 10-years ago in 2006. Their wine is a testament to the family’s history of working the ground for many years and are true to the vineyard the grapes were grown in. For more Dry Creek Dad’s – check out our Father’s Day blog! In Dry Creek Valley, the Rueds have 70 acres including: Cabernet Sauvignon, Chardonnay, Pinot Gris, Sauvignon Blanc, and Zinfandel which according to Richard are seeing a great year so far. This year the vines are really growing due to the increase of water they received during winter and the spring rains. The previous drought years were a means for concern, but this year’s growth is a great sign and gives Richard hope for the 2016 vintage. “Vines are doing good. They look good!” states Richard. Blooms came a little quick this year, but Rued feels that the timing standard has been consistently inching earlier. His Chardonnay vineyard, planted in 1990, just behind the tasting room, must be nearly 7-feet tall. Bunches of grapes are full and are starting to get tighter. What’s next for these vines? The Rueds are anticipating an early harvest in August, but have fingers crossed for September. For these Sauvginon Blanc & Chardonnay grapes, they are harvested first and earliest in the day. White grapes due better when picked in cooler temperatures. A very big thank you to Richard and Dee for taking the time to sit and talk with us about their family and vines. It’s members like these that make the Dry Creek Valley rich and rooted in values that we hold near and dear. And a very Happy Father’s Day to all! For daily updates on all of our Dry Creek Valley wineries and vineyards, follow us on Instagram at @drycreekvalleywines and be sure to like us on Facebook @drycreekvalley to keep up to date on all that’s happening! In Mid-March, the rain subsided for a week in our idyllic Dry Creek Valley. We were able to venture out into the vineyards for a chat with, 2nd generation winegrower, Rich Mounts. His vineyards surround Mounts Family Vineyards with 140 acres of Zinfandel, Cabernet Sauvignon and many specialty Rhone varietals for Mounts’ Verah label. So what happens in our Dry Creek vineyards in mid-March? A lot more than you think! Here’s what Rich Mounts has been working on. Pruning is a honed and coveted technique among wine growers. There are some who’d debate the “correct” technique for hours and hours. Over the winter vines sprout long vines out that won’t produce high (or any) amounts of wine if left unkempt. An older technique that Rich goes by, is you prune by the size of the wood. If it’s smaller than a pencil, you’d only leave one spur, smaller than your finger, two, and smaller than thumb, three. But the general rule now is to leave two. Depending on the anticipated weather for the year, you can tailor the sugar content in your grapes at this point. Less spurs, results in higher-sugar wine, but if it’s a hot year and you expect major growth, you can allow for more spurs on your vine. For the timing of pruning, it’s safe to say that the last vines you prune, will be the later to the harvest party. So many early harvest varietals are pruned first, Sauvignon Blanc, for example and last to prune are Cabernet Sauvignon which tend to come later in the season. The majority of Rich’s 140 acres of vineyards are pruned. But due to the recent rain, there’s been a slight delay in completion. For the younger vines, it’s important to go through and prevent leaning of canes which could result in snapping of the vines. After everything has been pruned, Rich and his workers go through and point out weaker canes that need support. It’s time to train these vines how they should grow, and in this case, grower knows best! Happening all over Dry Creek right now is Bud Break! An exciting time as these little bundles turn into the fruit that creates your favorite wines. Each bud contains all of the ingredients in tiny forms — shoots, leaves, and berries, yet to be grapes. These buds were carefully left in place by pruners, typically two buds on each spur as explained above. Bud break usually happens around April/May, but due to warmer weather in the county, has started as early as March as you can see in these photos. Fingers crossed an early frost shatters these delicate little wine producers. In late winter, early spring you’re sure to notice the amazing cover crops adding lush greenery and color to our Dry Creek Valley. But did you know this is a vital part to ensure that our vineyards’ soil contain the perfect nutrients to produce quality wine? Many vineyards plant bright yellow mustard. But Mounts is partial to legumes! Rich plants a combination of bell beans, peas, and vetches. Not only do these crops release nitrogen into the soil but they also create great organic material that turns to into basically humus. This improves the structure of the soil. At this time in March you’ll slowly start to see less cover crops as growers and workers are working them down back into the soil as soon as the earth is dry. That’s a brief summary of where our Dry Creek Valley vineyards are now. A big thanks to grower, Rich Mounts, for such a detailed tour of his vineyards and taking time out of his morning. Be sure to check out Mounts Family Winery on your next trip out to Dry Creek Valley for a gorgeous view, delicious wines and authentic Dry Creek Valley history. Canes: Canes are the one- or two-year-old branches of the grape plant. They grow as shoots off the main trunk. Vine growers train them to grow horizontally along wire trellises. It is from buds on these canes that the leaves and fruit of the grapevine grow. Humus: dark, organic material that forms in soil when plant matter decays. Spur: Spurs are little arms that grow from the cordons. From the spurs grow one-year-old wood, which produces the leaves and grapes. Nick Goldschmidt moved from his New Zealand home to Healdsburg in 1990. Says Goldschmidt, “Dry Creek Valley was ideal for us. We can’t be as close to the ocean as we were in New Zealand but at least we have the river. It’s a magic spot.” Twenty-five years later, Goldschmidt has now lived half his life in Sonoma County, though he’s such a world-traveler that one can hardly say “home” is any one place. Goldschmidt grows grapes and makes wine in Sonoma, Argentina, Chile, New Zealand, and other locations, as consulting winemaker for dozens of wineries worldwide. Though Dry Creek Valley has historically been best-known for its zinfandel, Goldschmidt has long championed the region for its merlot. His Dry Creek Valley vineyard is seven acres, all planted to merlot clone 337. Goldschmidt explains, “The soil is really loam over river gravels. What I find is that there is really good water holding capacity which seems strange for this area but I am a big proponent of not having dehydration in merlot and so this works well. The grapes we pick are fully-ripe with fresh fruit elements and soft tannins.” His Chelsea Goldschmidt Merlot–named for one of his three daughters–earned a 92-point score in Wine Enthusiast in 2006, its first year of production. This year has been a big one for Goldschmidt. The Kiwi got a rare American honor when his wines were served at the White House. The event was even more memorable, since Goldschmidt is an old friend of White House sommelier, Daniel Shanks. In other honors, Sonoma Magazine spotlighted Goldschmidt in their “Top 100 Wines” issue and included two of his wines among their favorites. Goldschmidt is a dedicated educator, inspiring other winegrowers in Sonoma and beyond. He is a frequent guest lecturer at UC Davis, Fresno State, and Cal Poly, has written multiple articles for the American Journal of Enology and Viticulture, and is a regular speaker at American Society of Viticulture and Enology conferences and at the Unified Wine & Grape Symposium. 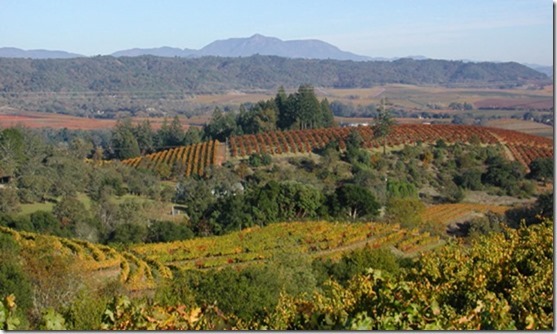 Fall Creek Vineyard, located at the northernmost end of West Dry Creek Road, sits on a long, narrow piece of land that borders both Dry Creek and its namesake, Fall Creek. Just half a mile from Lake Sonoma, “It’s just a hair warmer than the rest of Dry Creek Valley, so frost is not really an issue,” says Dane. Of the 37 acres of land; 30 acres are planted with zinfandel, 5 acres are merlot, and 2 acres are cabernet sauvignon. The oldest vines in the vineyard are about 50 years old, and were planted by Dane’s father, Hereward Petersen. The soil in the vineyard is red and rocky alluvial soil that has come down from the hills above over millenia. Seghesio Vineyards purchases Fall Creek Vineyard’s oldest vines. Every day, Bob Littell goes for a walk through his Treborce Vineyards and inspects his vines, with pruners on his belt, tape in hand, and his dogs–German shorthaired pointers he rescued–for company. If he sees a problem developing, he can nip it in the bud, literally, or if he wants to keep an eye on a particular vine, he can mark it with colored tape so his vineyard manager and crew know to watch it closely. There’s a constant breeze in the vineyard in the afternoon, so Treborce Zinfandel grapes aren’t as susceptible to some of the challenges posed by the area’s prevalent fog. Nonetheless, it takes continuous monitoring and hard work year-round to produce top-notch fruit, which is essential to making top-notch wine.